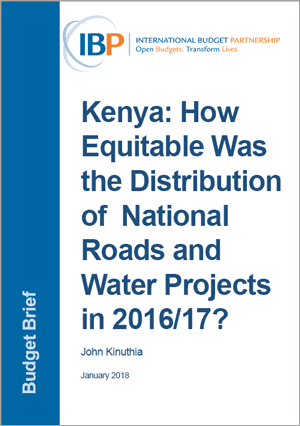 Kenya: How Equitable Was the Distribution of National Roads and Water Projects in 2016/17? Dissatisfaction with the way in which resources have been shared in Kenya has colored the country’s post-independence history and has been a key driver of legal and fiscal reform. However, while principles of equity have clearly informed these reforms, there remains little discussion of equity in regard to the massive funds that remain with the national government, which spends the largest share of revenue through its Ministries, Departments and Agencies (MDAs). One factor that has hampered discussions of equity in national government spending is the lack of disaggregated information about spending, especially regarding capital expenditure. However, in Kenya’s 2016/17 national budget, MDA development budgets were broken down to the individual project level, showing the distribution of development projects across the country in all MDAs. This budget brief looks at the geographical distribution of capital projects in the State Department for Infrastructure and State Department for Water Services in Kenya’s 2016/17 budget. The Department for Infrastructure was selected because it is one of the biggest spenders of capital funds. In the case of the State Department for Water Services, while water and sanitation functions are devolved, a large portion of what is spent on water in Kenya is still spent by state corporations at the national level.